I have a large but difficult yard due to trees and some hills yet this mower does a fine job. I purchased at Lowes for $899 and added the twin bagger attachment and anti-scalp wheel kit that I ordered online (total investment approx. $1200). The bagger is very easy to attach taking all of 5-8 minutes and best of all, the mounting brackets stay put on the rear out of the way until needed; simply hang the bags. Engine is 15.5 Briggs single, overhead valve and pulls straight up a steep hill easy. Cutting belt is easy to replace on this one. I have read some bad reviews on MTD products but have had zero issues with this one, my neighbor has had one for 12 years. If you use it to cut grass and not brush and don't trash it on rough ground it should be a decent, cost effective investment. it was designed to do that. a safety feature put into mowers to prevent going backwards and running over children. That didn't go over too well because you always had to disengage blades to go in reverse then reingage them to go forward. So they installed switches that allowed you to cut in reverse. The kill switch on a bolens can easily be disconnected and that will allow your mower to run and cut in reverse. When you shift it into reverse the shifter contacts a kill switch under the mover. Pull the wire loose from that switch and you are good to go. I got my lawnmower in 2006 and eight years later, it STILL performs very well. I'm truly amazed at how well it climbs. It doesn't back down from anything. I am truly pleased with this purchase. I keep it serviced regularly and cleaned and it performs just as well today as when I bought it. In my opinion an exceptionally good purchase. Anti Scalp wheel kit is available direct from MTD. MTD actually builds these machines. Phone number is 800-269-6215 the cost is $57.88 plus shipping. Hope this info helps. THis mower gets much better reviews than much more expensive mowers. 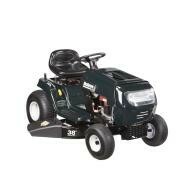 I recenntly purchased a Bolens 13.5 hp w/38" deck mower. I would very much like to order the anti-scalp wheels and brackets. Can you please put me in contact with someone that can supply these? By the way, I like the mower just fine except for the anti-scalp wheels not being on it and the fact that the seat does not move back far enough. The seat could have a taller back but I can live with what I have if I can just move it farther back. It is a little hard to start sometimes.